The cruise vessel is at home in polar regions or tropical waters. It has a highly fuel efficient diesel mechanical hybrid propulsion system and is 'battery ready' should an owner wish to incorporate a battery system for functions like peak shaving, supplementary power for manoeuvring or silent sailing. The vessel would be built to comply with Polar Class 6 and have 30 days of autonomous cruising capability. 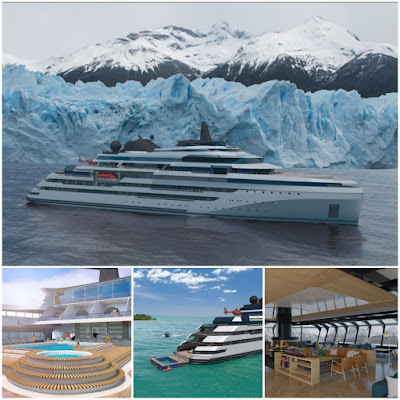 First unveiled in late 2016, the design was created in partnership with Expedition Voyage Consultants, which brings years of expedition operations expertise (one high-profile project was Crystal Cruises' inaugural Northwest Passage sailing in 2016) and the seasoned naval architecture firm Knud E. Hansen, whose designs have gone into the building of more than 700 ships. The concept is for a roomy, 112-passenger vessel in the high-end, luxury segment. However, spaces could be optimized to increase the capacity to 140 passengers.